Join the Zoo’s diverse team of active and outgoing adult Volunteers creating champions for wildlife! link students to real-world learning in the Zoo’s living classroom by leading curriculum-based school tours on the Zoo site. Parlez-vous Français? We also need fluent French speakers to lead school tours for French-immersion classes. connect kids and adults to nature at interactive activity stations throughout the Zoo and create champions for wildlife at special events. No contact with our plants or animals. Zoo Volunteers receive free admission for themselves and a guest as well as free Zoomobile rides and a discount at the Zoo shop. Successful applicants for this and all Zoo Volunteer opportunities are required to obtain a satisfactory Police Reference Check with Vulnerable Sector search at their own expense before carrying out any Volunteer duties. 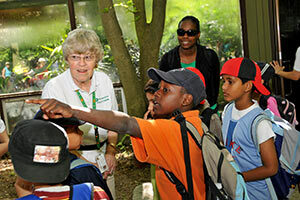 Toronto Zoo is accessible and welcomes Volunteers of all physical abilities. Volunteers must be able to move themselves throughout the Zoo’s large site. Year-Round Volunteer Training involves both in-class components and on-site hands on practical sessions through which trainees learn the animal knowledge and interpretive skills required for their role. Volunteer applicants much complete all weeks of training before volunteering at the Zoo. Weekend Year Round training: runs on consecutive Saturdays in October and November (8 days). The first training date is Saturday, October 13, 2018. Weekday Year Round training: runs on consecutive Fridays in November through to mid-February (12 days). The first training date is Friday, November 2, 2018. Recruitment for the 2018-2019 Year-Round program is now closed. Join our diverse team of dynamic and outgoing adults educating and inspiring visitors, taking the lead at special events, and promoting wildlife conservation. Inspire visitors' curiosity at seasonal interpretive stations throughout the Zoo, provide information to guests, and assist at special events. Secondary and post-secondary students are invited to enhance visitors' experiences at special events throughout the year and at our Zoo Kids camp during the summer months. Fun and flexible Volunteer opportunities that allow you to use your people skills and get a taste of what volunteering at the Zoo is all about.